Simona from Briciole is hosting this edition of Weekend Herb Blogging and this week I've felt the urge to play with pandan leaves. 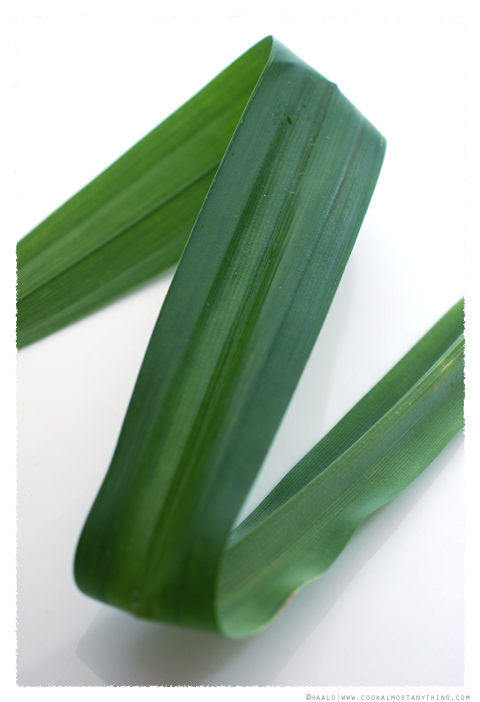 Pandan Leaf comes from Pandanus amaryllifolius, otherwise known as the Screwpine Tree and is used as a flavouring where it imparts a fairly ethereal aroma to dishes. It's the type of flavour that is hard to describe but you know when it has been used. The leaf isn't eaten, it's usually tied into a ribbon and cooked in the dish and then removed before serving. In that respect, it is a bit like using a vanilla pod. 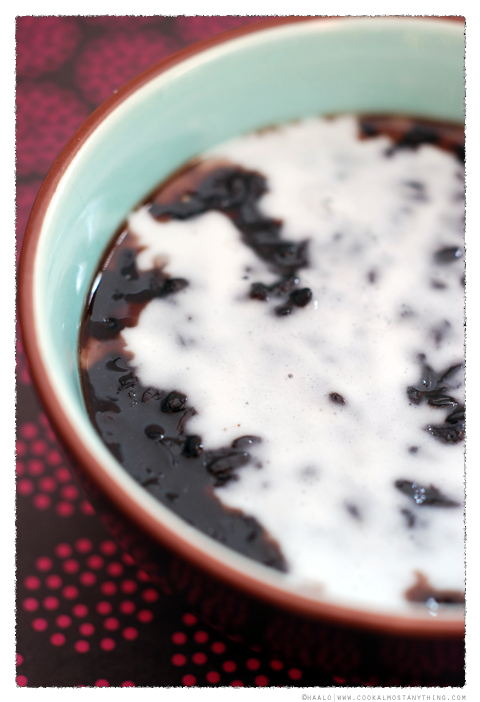 The recipe I've made today is one that has re-entered my mind since I saw it recently on an episode of Hairy Bikers Mums Know Best - it's sticky black rice served with pandan infused coconut milk. Place a pandan leaf and the coconut milk into a saucepan and simmer very slowly, without boiling until thickened. 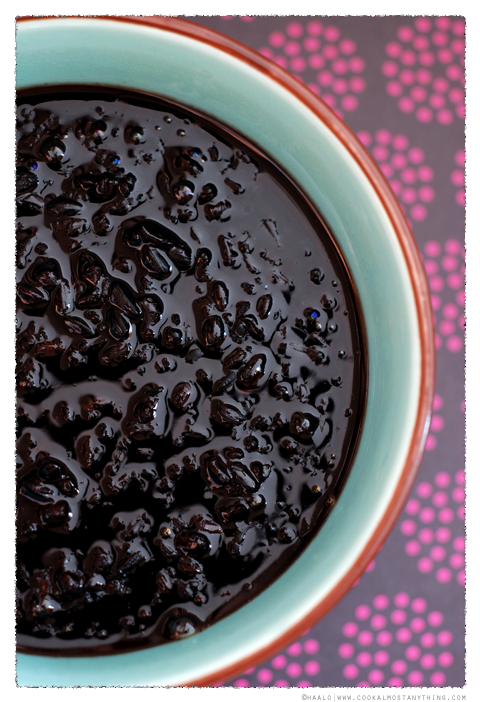 You might find black glutinous rice sold under other names such as Thai Black Rice, Sticky Black Rice or Thai Purple Rice - it does not contain gluten but gets its name because of glutinous properties when cooked. The unsoaked rice to the top and the soaked at the bottom. Drain the soaked rice and place in a saucepan with about 2 cups of water and a pandan leaf - simmer this slowly until the rice has cooked through - it should have a somewhat chewy texture. Add the sugar, stir until dissolve and allow to simmer for another 5-10 minutes. You'll end up with a thickish deep purple liquid surrounding your grains of rice - remove the pandan leaf and discard. 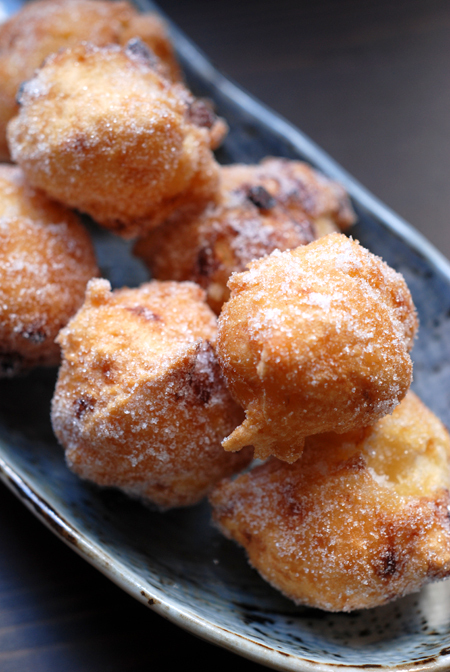 Serve it topped with a generous drizzle of coconut milk. What a gorgeous looking pudding. I've never had black rice or tasted pandan, so I wish I could come over and try some! Oh my! Very interesting recipe to me. This is beautiful, Haalo. Where can I find pandan leaves? I would really like to try some. I actually have that rice in my cupboard: such an interesting color! @Simona - you should be able to find frozen pandan leaves in the freezer section of a well-stocked Asian grocery. In Southern California (especially around Westminster / Little Saigon) you can probably find fresh pandan leaves. I'm pretty sure I will never find a rice pudding I don't like but this one looks especially delicious! I hope my Whole Foods has some black rice so I can try this! Thanks Kalyn - it's certainly quite different to a normal rice pudding! Thanks Simona - hope you find those leaves! awwww, that is one of my favorite desserts. i had the best version in thailand. now, i do believe yours is very close to perfection! This is a really stunning recipe and the photos are beautiful! 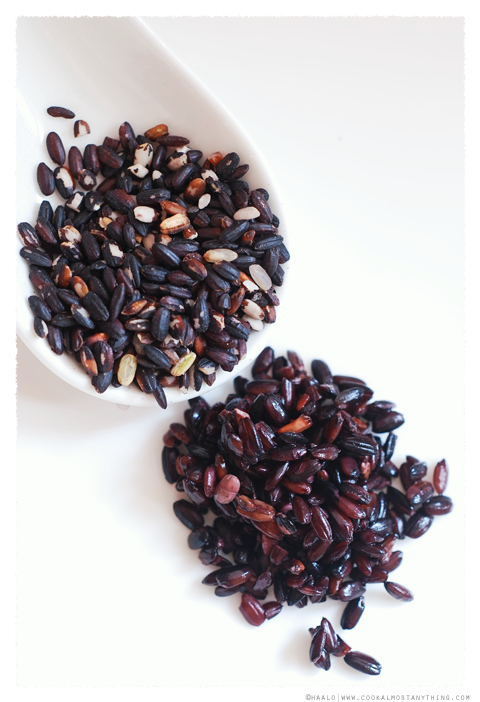 We just experimented with black Japonica rice and couldn't have been happier with the result.